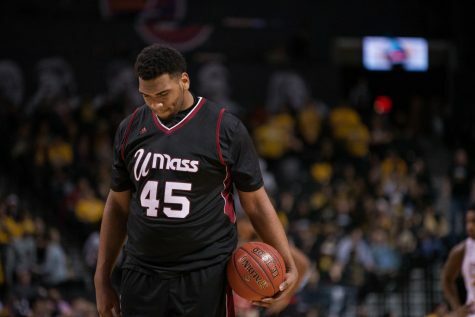 Saturday marked a night of firsts for the Massachusetts men’s basketball team, but not in the variety it would hope for. 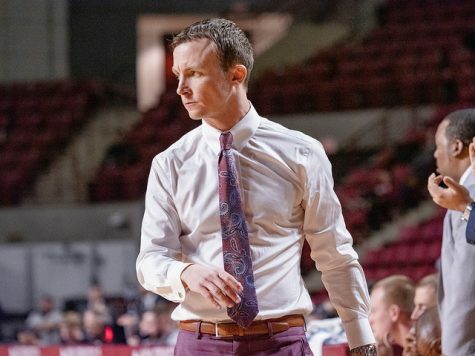 Not only did the Minutemen (18-8, 7-5 Atlantic 10) lose two consecutive games for the first time this season, they also dropped their first home game of the season as they fell to La Salle, 72-71, in heartbreaking fashion at the Mullins Center. Terrell Vinson’s jumper as time expired was ruled a 2-pointer after replay monitors revealed that his foot was on the 3-point line, keeping the game from overtime and allowing the Explorers (18-9, 7-5 A-10) to escape with the season sweep. With six minutes, eight seconds remaining in regulation, a Ramon Galloway 3-pointer from the left wing gave La Salle a commanding 60-51 lead. 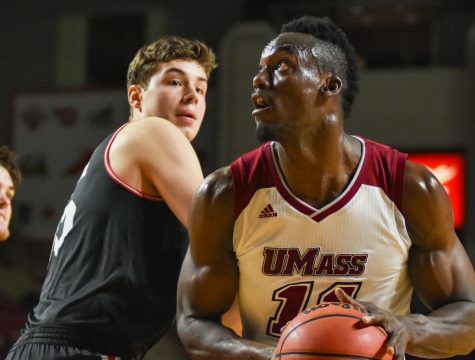 But thanks to a breakout performance from freshman Maxie Esho, the Minutemen clawed back into the game. 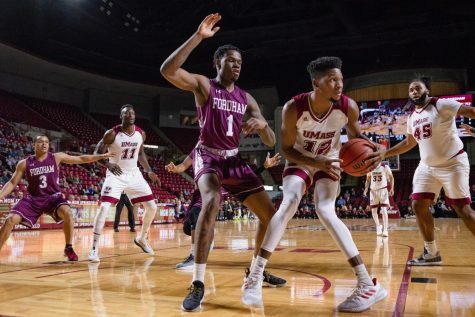 UMass went on a 12-2 run over the next two minutes, a run that was capped by Esho’s and-1 conversion that put the Minutemen up by one point with under four minutes to go. The Explorers responded though. 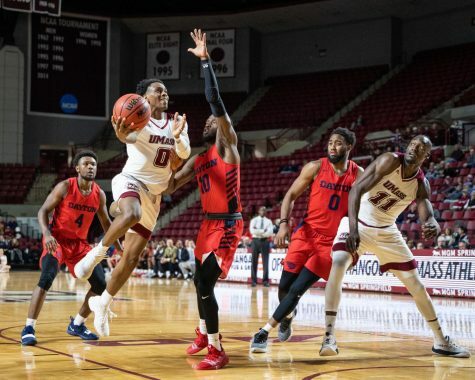 After Chaz Williams cashed in on a 3-pointer to put UMass up by two, Galloway found Jerrell Wright underneath for an easy deuce to knot the game at 66 with 2:51 to go. After two minutes of scoreless basketball, Tyreek Duren ended the drought with a step back, fadeaway jumper in the lane that gave La Salle a two-point lead with 50 seconds left. Jesse Morgan missed a 3-pointer on the other end, but Esho gathered the offensive rebound and was fouled. He missed the front end of a one-and-one, however, and the Minutemen were forced to foul. 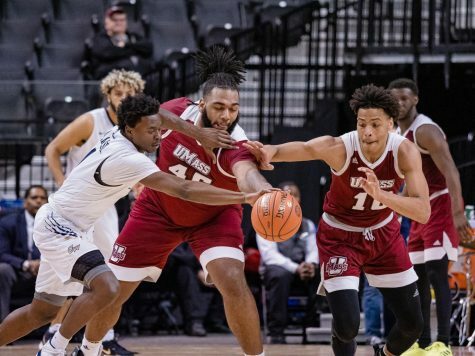 Earl Pettis went 1-for-2 at the line with 32 seconds remaining, keeping UMass within striking distance, but Williams missed a layup going the other way, and then Duren hit one free throw at the line on the other end to put the Explorers up by four. Raphiael Putney then missed a 3-pointer, but Esho crashed the glass again, brought down the rebound, and got three the old-fashioned way to keep the Minutemen alive. They were down just one point with 13 seconds left. Duren was fouled and made two free throws on the other end. Williams then marched the ball up court and launched a 3-pointer that was off, but he got his miss and kicked it out to Vinson, who was inside the arc as he buried the long jumper at the buzzer. 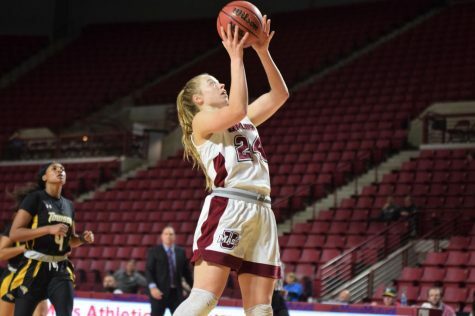 The Minutemen jumped out to a quick 15-5 lead in the first half thanks to the play of Putney, who scored 11 of UMass’ first 13 points, including three 3-pointers. But the Minutemen couldn’t hold onto the lead. Pettis responded by hitting four 3-pointers in a three-minute span as part of a 16-4 run by the Explorers that gave them the lead. UMass hung with them for the remainder of the half, and the game was tied at 33 after 20 minutes. 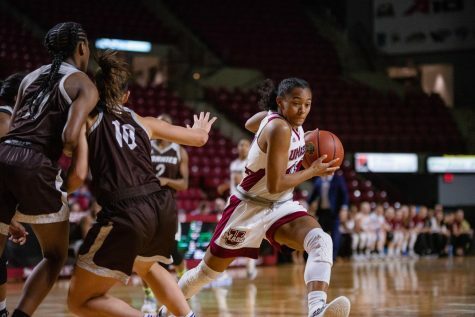 The loss was particularly frustrating for the Minutemen considering the outstanding play of Esho, who scored a career-high 18 points off the bench. 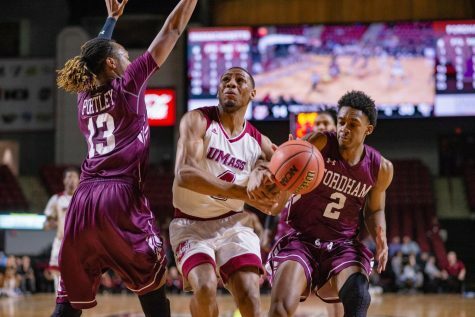 He helped UMass stay in the game despite the offensive absence of Williams and Morgan, who combined for just 6-for-22 shooting and 15 points. But despite Esho’s inspiring play, he was inefficient at the free throw line, going just 4-for-9. As a team, the Minutemen went 9-for-18 from the charity stripe. That, coupled with what Kellogg cited as sloppy offensive possessions and missed open jumpers. ultimately cost them the win. 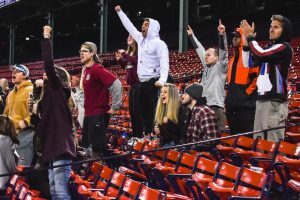 “Sometimes the plays that you don’t make and also a few things here or there lead to not coming away with the victory,” said Kellogg. 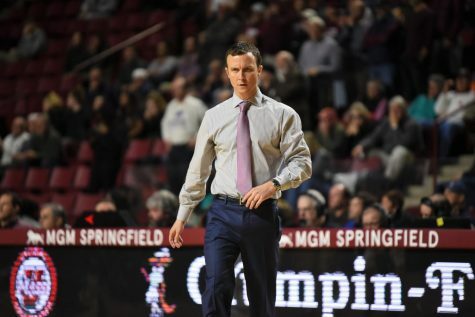 UMass will now have to get over the loss quickly, as a tough Xavier team arrives to the Mullins Center tonight. The Musketeers (17-9, 8-4 A-10) were ranked as high as No. 9 in the country early on this season. But since a bench-clearing brawl against crosstown rival Cincinnati on Dec. 10, they have gone just 9-9 and have dropped out of the national rankings. Still, despite their recent struggles, they still pose as a difficult matchup. Xavier currently sits in third in the conference standings after beating Dayton in overtime on Saturday night. 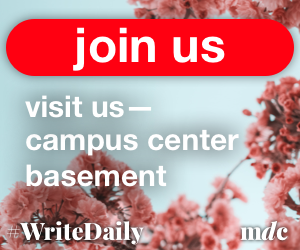 Stephen Hewitt can be reached at [email protected] and followed on Twitter @MDC_Hewitt.